With the new Cricket Star Slot Microgaming have micro managed (aha) another online development that will have you weeing your trousers with anticipation and excitement. 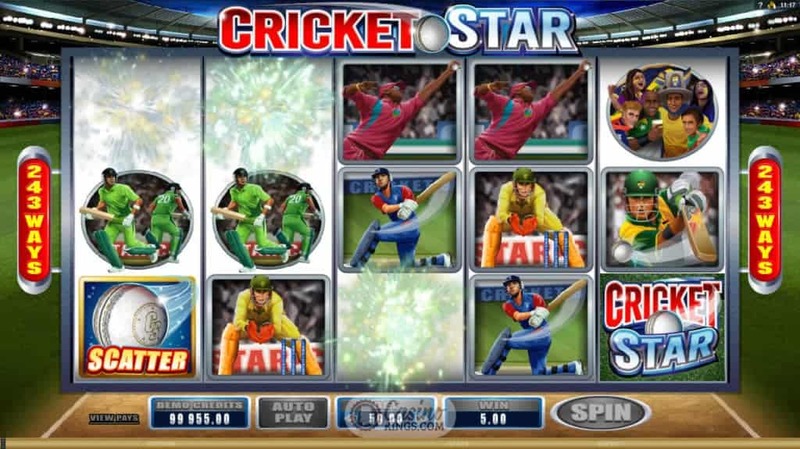 Cricket Star is a 100mph all-action slot title that grips you by the seat of your whites and takes you on a roller coaster ride of cricket-based excitement. And just like the real stars of cricket there’s a skin full of winnings to be had. How’s that! 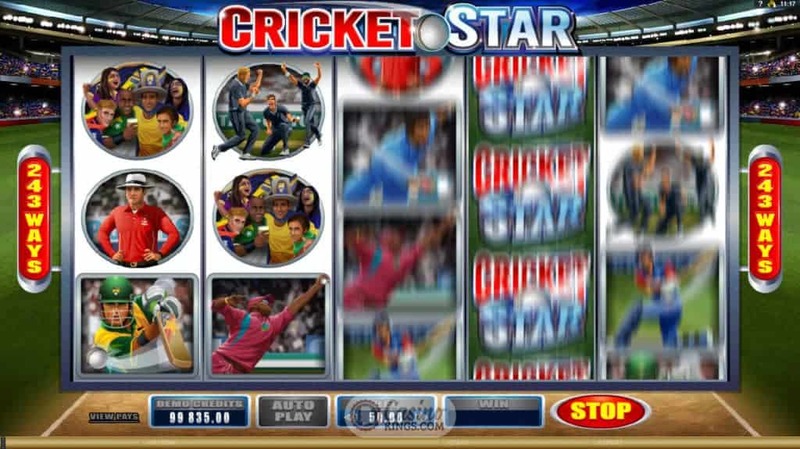 They say the trick in making a sporting slot release a successful one is in the action, and boy have Microgaming piled it on in Cricket Star. The five reels are practically alive with the gentleman’s sport, though the developers have wisely chosen to use World Cup colours rather than test match whites. This makes for vibrant gameplay, and with plenty of animations thrown in for winning combinations the slot version runs even faster than the game itself! The game uses Microgaming’s trademark 243 Ways winning system, rewarding players for left-to right adjacent winning combinations rather than standard payline wins. This system opens up the winning possibilities like a good batsman opening up the field, and the Cricket Star Logo Wild symbols make big winnings possible during play. The developers have even included a somewhat cheesy soundtrack that perfectly exemplifies the energy of sports programs and highlights show theme tunes. A cricket legend may think that a full spread during tea break is the perfect bonus, but there’s none of that in World Cup cricket. Fortunately we are treated to a helmet-full of bonus rounds, first of which is a Free Spins feature triggered by landing three or more Scattered Cricket Ball symbols. With the Rolling Reels™ feature winning reels explode to allow more reels to roll in, ramping up a multiplier as it does and bringing our match-winning bonus multiplier up to x10. In your Shredded Wheat, Botham! 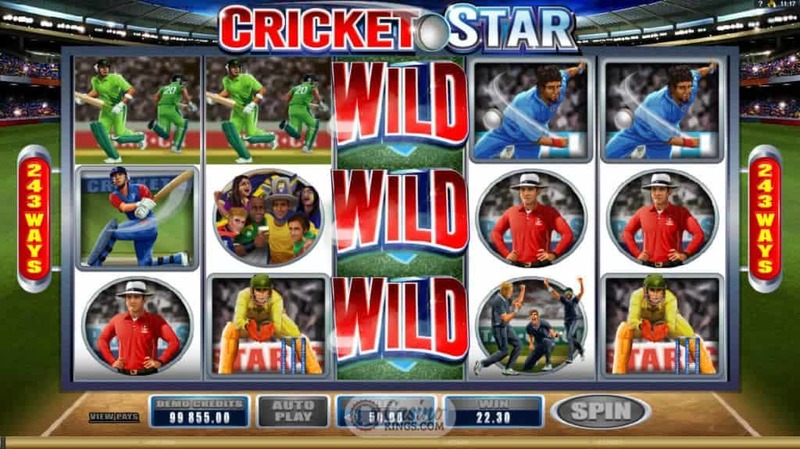 Microgaming has also included their version of a googly by including the Wild Wickets Bonus feature which is randomly triggered. A wicket springs up in our faces (must be an Aussie wicket) only for one stump to be smashed away by a giant cricket ball. The corresponding reel turns Wild, slapping us with an extra win bonus that will bring even the most wizened pro out of retirement, cartilage or not. 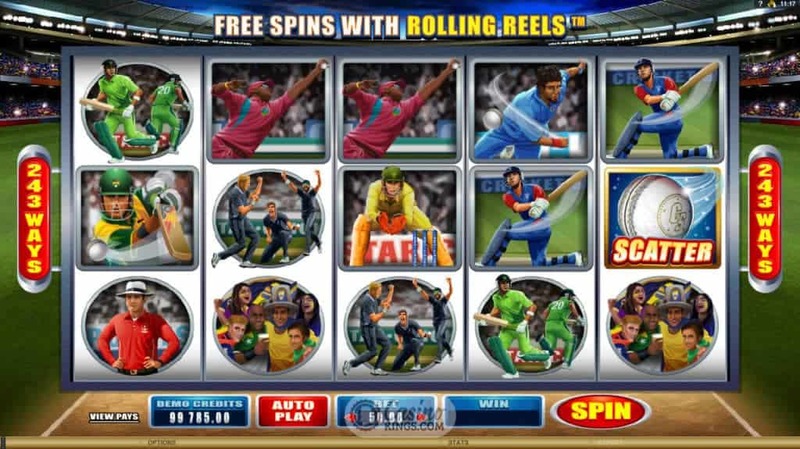 In Cricket Star Microgaming has captured the essence of World Cup cricket and transformed it to the reels. Even non-fans will be enticed with the stylized animations, while fans of the game can rejoice that no matter what country you’re from we can all be winners at cricket.